Over this past weekend a very good friend of mine (who is an accomplished magician) came to stay with me. He wanted to see me do a magical ritual from a grimoire. I decided to show him how I invoke an angel into a scrying mirror. The grimoire I chose to work from was 'Dr Rudd's Nine Hierarchies of Angels with their Invocations to Visible Appearance'. I did the rite that used the Ninth Key to invoke Gabriel & Levaniel. Moving & Calling, forth to visible appearance, the Celestial Hierarchy of Angels of the Order of Angels; whose principal governing Angels or Blessed Intelligences, bearing rule are, Gabriel, & Levaniel; & Residing in the first Orb, Mansion or Sphere, being the Orb, Heaven, or Sphere, of the planet Called Luna, or the Moon. (Rankine & Skinner, 2005, p, 207) (1). The name is Sadai, that is Omnipotent Satisfying all and Elhai which is the Living God, his numeration is Jesod, this is foundation, & signifies a good understanding, a Covenant, Redemption & rest, and hath his influence through the Order of Angels, called by the Hebrews Cherubim, into the Sphere of the Moon; Causing the Increase & Decrease of all things, the Creation of man, & taketh care of all Genii or Keepers of men, distributing them; his particular intelligence is Gabriel, the Keeper of Joseph, Joshua & Daniel. (Rankine & Skinner, 2005, p, 87) (1). In the way that I have come to understand how angel magic works, I interpreted this to mean; to give a good understanding of the magical arts to enable spiritual growth and increase. This is accomplished through forming an agreement with one's spiritual nature to redeem oneself from the impurities of the lower nature, which contributes to the creation of the spiritualized individual. This results in a knowledge and understanding of one's own personal daemon. In short, we find in medieval angel magic a widespread tradition drawing upon classical sources, whose goal is to better the intellect and soul of the magician. (Plaisance, 2012, p, 145) (2). Delight not in the world: the Elements are defiled, the sons of men wicked, their bodies become dunghills, & their inward parts (the secret chambers of their hearts) the Dens & Dungeons of wickedness. (Rankine & Skinner, 2005, p, 74) (1). In an alternative text for the Ninth Key, it is written about the moon, "by its motion ruling the world, and treading Hell under her feet." (Rankine & Skinner, 2005, p, 88) (1). The ceremony consisted of lighting four quarter candles with a prayer, blessing the incense and lighting the charcoal with a prayer of consecration. I then laid the seal of Gabriel on the altar before the Obsidian mirror, and commenced with the preliminary prayer that is to be recited before calling the celestial intelligences. After this, I recited the Ninth Key invocation, then I settled into a scrying trance. At one point I seen a purple light quite small and compact over the top half of the mirror. This was not as significant as previous times. I also seen the odd white flash, but nothing that really grabbed my attention. Then, all of a sudden I seen an image of a sharp featured face and for whatever reason it reminded me of a transformer! After a little while I was getting nothing else, so I recited the second invocation called the replication. I then had a vision of a long road with many cars upon it. The vision was not in the mirror like the sharp featured face was, but I could see it with my eyes open while I could not see anything else, not even the mirror. Next I seen a yellow coloured caravan. I felt that this was not a very successful working, as I was not feeling anything except that of very deep concentration. I decided to state aloud what I had called the celestial intelligences for, and then I ended the rite. My friend (who was sat behind me to my right hand side) could also see the mirror and he told me that he seen a sharp featured face with eyes looking at both of us. He said it gave him no impression of hostility, but was extremely interested in us, and had a strong sense of curiosity. He said it was looking at me for some time. He also said this spirit moved about around the mirror at times, until it was replaced by an owl that flew around the mirror. 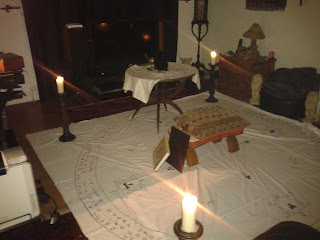 This was most intriguing, especially considering the purpose I had done the ritual for, which was basically for wisdom. After discussing the results of the ritual we both called it a night, as it was around 2am. That night I had lots of dreams, the most significant one involved me going to see a house that I was going to swap mine for. This house was bigger than mine and had a spare room that I wanted to turn into a temple. I told the man who owned the house what I wanted it for. He then told me about a magical talisman he had, which his wife showed to me. It was a talisman of Abrasax, which was lovely and shiny. He didn't know what it was, so I told him and he said I could keep it. Throughout the following day I felt very tired and drained of energy. the rite did go on for over an hour. I don't think it was this and the fact that I had done the ritual late at night that made me tired. The tiredness was as if I had been totally drained. There were no other odd things that I can remember, except for my cat being sick the following morning after the rite. I have had my cat for nearly two years and she has never been sick before! This was the first time I have had someone watch me do a ritual from a grimoire, and the results are quite intriguing, especially as we both seen a face with very similar characteristics! A good thing about this rite is that it has totally re-ignited my magical practice, which had been dormant for a few months. Not only that, but I definitely feel clearer of thought and very focussed, and I know my magical plans for the coming months. I have also started to work with the Papyri and Michael Cecchetelli's The Book Of Abrasax. 1. Rankine, David & Skinner, Stephen., 2005. The Keys to the Gateway of Magic Summoning the Solomonic Archangels and Demon Princes. Singapore: Golden Hoard Press. 2. Lycourinos, Damon Zacharias., (ed.) 2012. 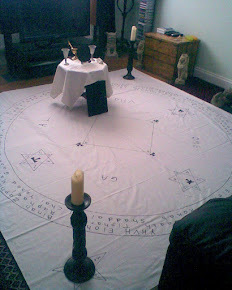 Occult Traditions. Melbourne, Numen Books. That sounds most interesting! I am especially intrigued by the appearance of the owl. Great post Darren! The vision you received after the second invocation sounds very similar to the way my own scrying manifests - the vision comes in and kind of blots out everything with crystal as it's 'pivot'. Then I am immersed in it, rather than seeing an image in the crystal. Though, sometimes I do see colours swirling around the crystal. Always interesting to hear how other people experience it. Thank you, it is strange how it works sometimes, isn't it. The experience is just like dreaming, but with one's eyes open! Good Job Darren.. Thank you it's a very interesting post. Did you ask fot the spirit's 'name' ? Hi Omega, hope you are keeping well. No I did not get to ask the spirit for its name, because I thought it had gone. Since this ritual though, I have been feeling rather positive about all things in general and positive things have been happening! This always seems to be the way when working with angels! I have read your interesting posts. I can say you sound very illiterate when you say "I seen", you use this incorrect grammar over and over and over again. I assume you do not know the correct word, it is "saw", "I saw". A saw is more than a tool with which to cut things, it's also the past-tense for the word see. Use this new knowledge to increase your understanding. Concerning Jesus, Jesus is God. Jesus lives, Jesus is the resurrected Messiah, Jesus is resurrected and lives this very second. To not know this is to not know the nature of spirits. To remove an un-friendly spirit simply say out loud, "In the name of Jesus Christ depart hence", 100% of the time they will depart. They can return hours later if you do not have the house blessed by the Holy Spirit or follow in the faith of Jesus Christ continuously. I have met many spirits, all evil spirits have been removed when I used the above 'incantation' if you will, but I have faith in Christ. I do not believe it would be as powerful from one who believes Christ is as real as Thor, but it will still frighten the spirit, as all spirits believe in Christ. The reason Christ is referenced thousands of years before He was born in the flesh is because angels manifested themselves to Adam and Eve and taught them about the coming Christ. The foreshadowing of the Messiah is written about in many cultures, this is because Christ is the Master of the universe. God lives, Jesus is God. The most powerful name in the universe is Jesus Christ. Evil fears His name, truth loves His name. Thank you for pointing out my grammar mistake, I always welcome correction in this regard. I only have a level three in English, but since I started writing, it has been improving! Personally, I see the anointed one as a manifestation of divinity within every individual, although this manifestation varies according to which culture it manifests in. So using the name of Christ for an ancient Egyptian spirit would not be as useful as using the name Heru. Great post I have only just returned to the western traditions after many years absence. I was fascinated by your floorcloth which circle design have you used and was it fashioned by yourself ? Hello Darren. Thank you for always sharing your experiences with us. I would like to ask if there's a way to contact you. My e-mail is v.augustosilva@gmail.com. I really hope there is, I'm waiting forward to it. Interesting posts on this blog mate. We kinda have the same interests in occult and stuff. You might wanne check out my blog too, its http://www.cultofamonra.blogspot.com cya !